Last fall, University of Dayton sophomore Sarah Presley spent several afternoons each week working with juvenile offenders from the Dayton area attending a community-based alternative-to-confinement program. Presley, a criminal justice studies major from Cleveland, helped lead group sessions at the Montgomery County Juvenile Court’s Evening Reporting Center (ERC), which seeks to reduce youth recidivism by providing life-skills coaching and counseling during hours in which young people are most likely to commit crimes. Presley said the juveniles were receptive to her and other University students, being somewhat close in age. They especially enjoyed engaging in role-playing exercises to help them learn to use more socially accepted ways to address issues. Launched in 2014 by Montgomery County Juvenile Court Judge Anthony Capizzi, the ERC serves teens ages 14-19. The court assigns them to the program during the evening hours five days per week, for up to 21 days, to get extra support they aren’t receiving at home. The youths are transported to and from Mt. Enon Baptist Church in Dayton, which hosts the program in partnership with the juvenile court. There, they have access to a probation officer, therapists, counselors, group sessions, computers for homework, a gym for recreation and a daily dinner. In fall 2018, the University’s Criminal Justice Studies (CJS) program launched the new service learning initiative for at-risk youth in partnership with the juvenile court’s probation department. Presley and fellow students Mary-Katherine Cain and Lily Hannibal worked with ERC staff during the fall 2018 semester. Three new students — Laura Franklin, Halsey Krupp and Widad Mukhar — are participating in the program during the 2019 spring semester. 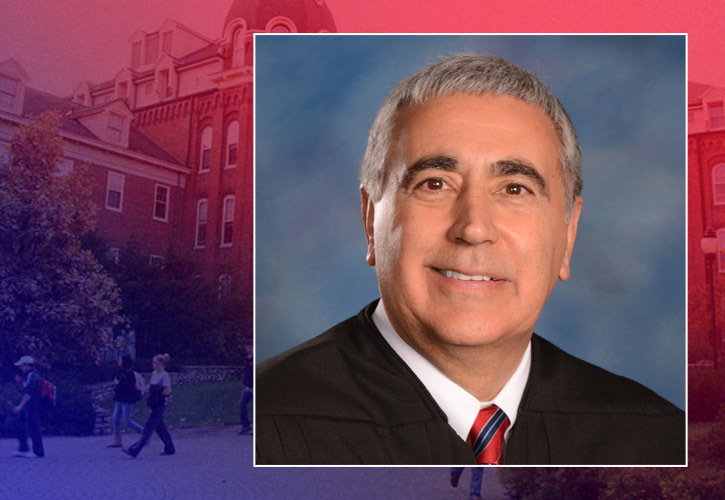 “It gives students the opportunity to meet with children who have had challenged lives, to see if they could help these young people through that period of their lives,” said Capizzi, who received his law degree from the University in 1979. Cain, a junior criminal justice studies major from Peoria, Illinois, was offered and accepted a part-time job with the juvenile court as a result of her fall semester internship at ERC. “Although the nature of ERC is a sad one, having the opportunity to positively impact these kids’ lives is extremely rewarding,” Cain said. Students enroll in a CJS service learning experience course and earn one credit hour for 50 contact hours with the agency. They start by observing ERC staff and then transition to co-facilitating group activities as they become more familiar with the program. They volunteer for 3-4 hours each week, journal weekly about their experience and write a reflection paper at the end of the semester. Criminal justice studies majors’ course work often involves case studies, said Stacey Siekman-Hall, a lecturer and coordinator of CJS experiential learning. Serving at ERC allows students to put classroom concepts and behavioral interventions into practice. It also allows students interested in criminal justice, social work, legal or education careers to observe and better understand the youths’ emotions. “It really gives students a place to see those things that they are learning applied, and see the difference they can make in people’s lives,” Siekman-Hall said. Capizzi said the students also benefit from interacting with probation officers and other senior members of the court’s staff, as well as the psychologists and therapists who visit the ERC to see their young clients. This helps students develop professional relationships that could lead to a job after graduation. Capizzi received positive reports about how well the student-youth interactions worked during the fall semester. The youths enjoy the relationship with University students, who share similar interests but different life experiences. “I think it is good that we have young adults from the University, who are ages 17 to 21, who have been successful,” Capizzi said. “Many of these young people who are attending the Evening Reporting Center may not have had family support such to the point that they would even consider going to college. The University’s criminal justice studies major is an interdisciplinary curriculum comprised of faculty in sociology, anthropology, social work, political science and psychology. For more information, please visit the CJS program’s website. Associate Professor Joseph Valenzano III, chair of the Department of Communication, recently discussed how the immediacy of social media influences the online community in real time, potentially allowing opinion to take the lead over factual contexts. Follow this and other recent media coverage of the service, research, scholarship and commentary of College of Arts and Sciences programs and their faculty. With recent media attention about alleged past racist actions by public figures, Professor Leslie Picca, chair of the Department of Sociology, Anthropology and Social Work, discusses her research on the use of racist language, ideas and stereotypes in social interactions. Follow this and other recent media coverage of the service, research, scholarship and commentary of College of Arts and Sciences programs and their faculty.